These are 2 mid century modern dressers by BasicWitz from their Basicana collection. Both of the dressers have their signature brass accented and vertical drawer pulls and sculpted tapered legs. The tall dresser has 5 dovetailed drawers: 36″W x 18″D x 46″H. The low dresser credenza has 6 dovetailed drawers: 54″W x 18″D x 31″H. These are 2 mid century modern side end table nightstands. The first is by BasicWitz, has a parquet design with 1 modern angle pull dovetailed drawer: 22″W x 15″D x 22.5″H. 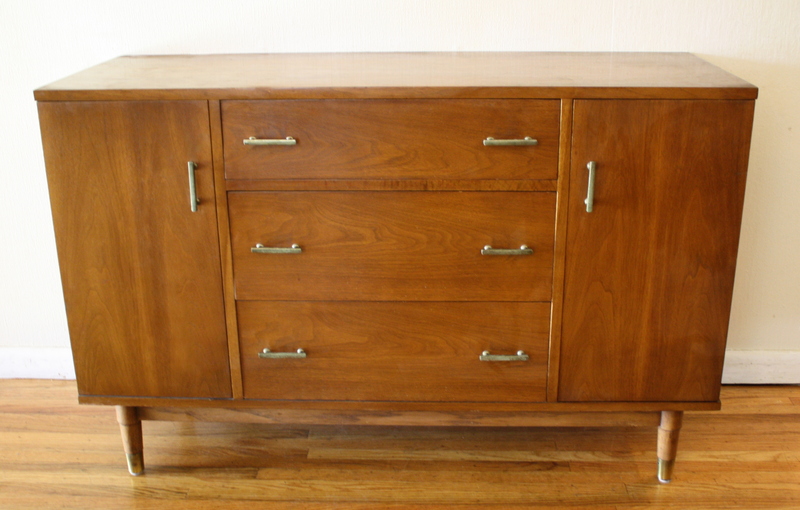 The second has 1 dovetailed drawer with dual knobs, open shelf, and brass tipped tapered legs: 18″W x 13.5″D x 25″H. 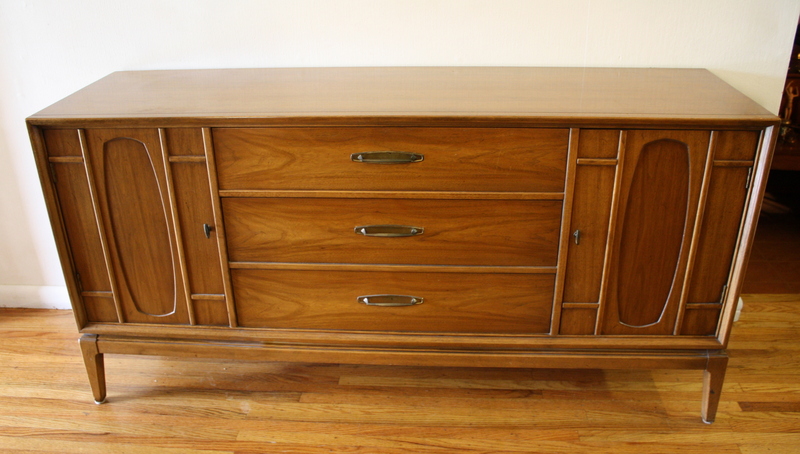 This is a mid century modern low dresser credenza by BasicWitz. It has 9 dovetailed drawers, the top 3 with an inlaid wood diamond design, the bottom 6 drawers have streamlined vertical handles. Dimensions: 66″W x 18″D x 31″H. Also featured is a mid century modern side end table nightstand with a routed diamond design. It has 1 dovetailed drawer, a bottom shelf compartment, and tapered legs. Dimensions: 20″W x 13″D x 26.5″H. Both dresser and nightstand are sold. These are 2 mid century modern low dresser credenzas by Basic-Witz. The first low dresser has 6 dovetailed drawers with their signature vertical handles and brass accents, and tapered legs. Dimensions: 54″W x 18″D x 31″H. The second credenza has 3 dovetailed drawers with their signature vertical handles, 2 side cabinets with beautiful door handles and tapered legs: 56″W x 18″D x 31″H. 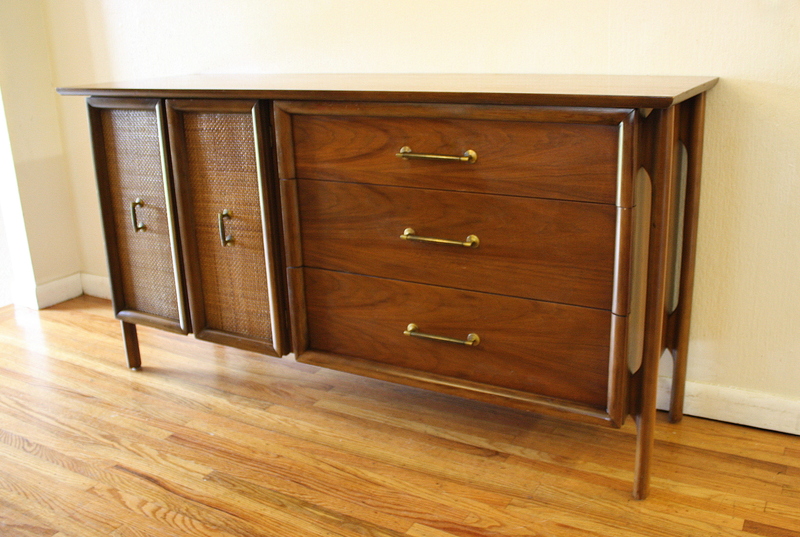 This is mid century modern low dresser credenza by BasicWitz. It has a parquet diamond detail with silver knobs for the top drawers, vertical handles for the rest of the dovetailed drawers, and tapered legs. Dimensions: 66″W x 18″D x 31″H. This is a selection of mid century modern credenzas. The first credenza has 1 side cabinet with rattan doors, 3 dovetailed drawers and sculpted leg details: 60″W x 19″D x 31.5″H. 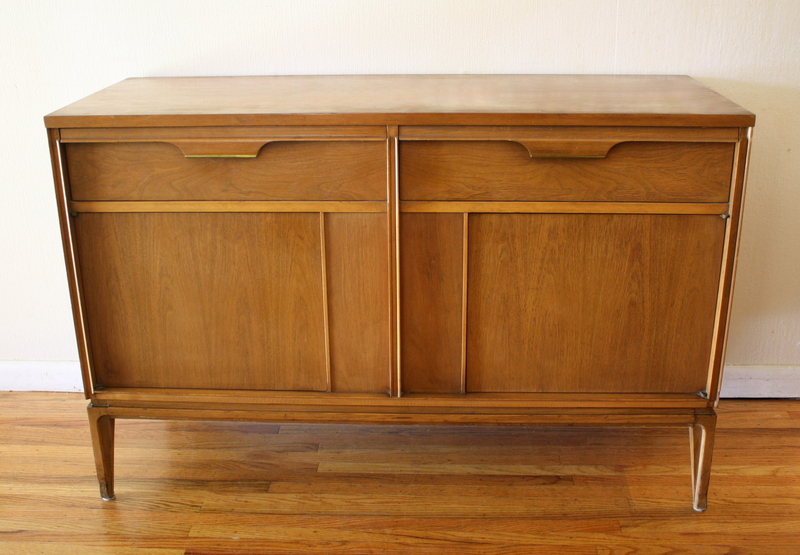 The second credenza has 3 dovetailed drawers and 2 sculpted wood side cabinets: 62″W x 18″D x 30.5″H. 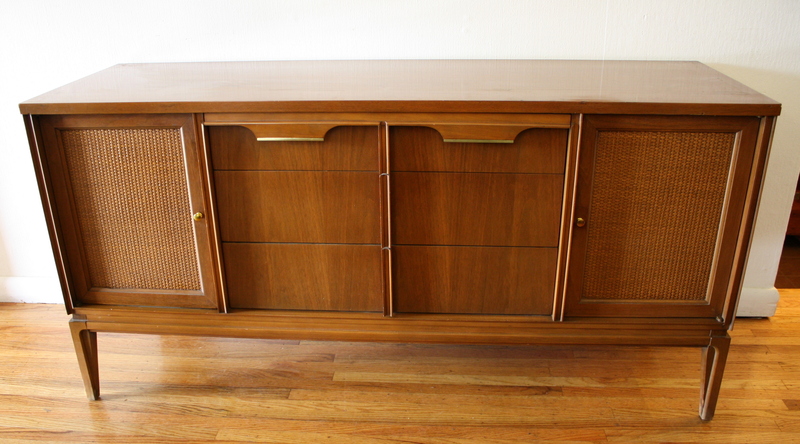 The third credenza is by BasicWitz, has 2 side cabinets with rattan doors, and 3 dovetailed drawers with brass tipped accents and a streamlined design: 56″W x 18″D x 28″H. All these credenzas are sold. These are 2 mid century modern mini credenzas. The first is by Basic Witz, it has 2 brass handled drawers, and 2 bottom cabinets: 48″W x 18″D x 31″H. The second is by Drexel, has 3 brass handled larger drawers, and 2 side cabinets (one cabinet has a mini drawer): 48″W x 18″D x 31″H. These are 2 mid century modern credenzas by BasicWitz. The first credenza has 3 bottom cabinets and 3 dovetailed drawers. The second credenza has 2 side cabinets, and 3 dovetailed drawers. Both credenzas have brass accented drawers, and rattan accented doors. This is a mid century modern armoire dresser and side end table he first by Basic-Witz. Both have an arched base and streamlined framed dovetailed drawers. Dimensions of side table: 22″W x 15″D x 24″H. Please check captions for prices and availability. These are two great mid century modern pieces by Basic Witz. We have a mini dresser and mini credenza made of solid wood, with mcm formica tops, and brass handles. The mini dresser has 3 dovetailed drawers and the signature mcm tapered legs. The mini credenza has two doors that open easily, two dove tailed drawers, a lower shelf, and tapered legs. Both have great storage space while still being compact and perfect for small spaces. Mini credenza is sold. Mini dresser sold in a Picked Vintage sale featured on Fab.com. This is a mid century modern solid wood low dresser by Basic Witz. It has 6 beautiful dovetailed angled drawers and 3 additional smaller drawers in the middle. It has the maker’s marks inside the drawer and the signature tapered legs. Also great as a credenza, buffet, sideboard server or media center.